Let me start by saying that I’m not that into pork. I mean sure, every southern mom has a good pork roast recipe in her back pocket, and so did mine, but frankly, a big hunk of pork is frequently somewhat inferior to its cured cousins—bacon, sausage, salted ham, salami, prosciutto. Moreover, a pork loin is big…and I’m usually just cooking for two or three. So when I’m at the store and there’s already organic, thick-cut bacon in my basket (which there invariably is; J’s influence has made bacon a staple in my fridge), purchasing a pork roast is something I rarely consider. Combine all brining ingredients except pork loin in a 3- to 4-quart saucepan and heat over high heat, stirring, until salt is dissolved. Pour brine into a deep 4- to 5-quart pot; cool to room temperature, uncovered, about 2 hours. Add pork to brine, making sure it is completely covered by brine, and marinate, covered and chilled, 8 to 24 hours. Pat pork dry (discard brine) and remove any strings, then transfer to a roasting pan. Stir together garlic, sage, and 1 tablespoon syrup in a small bowl and rub all over pork. 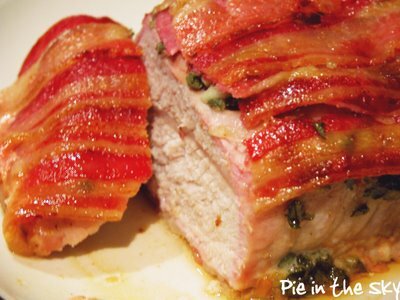 Lay bacon slices crosswise over loin, overlapping slightly, and tuck ends of bacon underneath loin. Roast pork until thermometer registers 140°F (if you’re not in college and do have an instant-read thermometer), about 1 1/4 hours. Stir together 1 tablespoon syrup and vinegar until combined. Brush vinegar mixture over bacon slices and continue to roast pork until thermometer registers 150°F, about 10 minutes more. Remove from oven and let stand in pan 15 minutes. 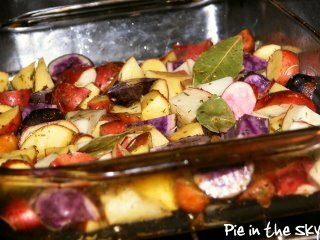 Transfer roast to a cutting board with a lip, reserving juices in pan, and let roast stand, uncovered, while making sauce. Skim fat from pan juices and discard, then transfer jus to a small saucepan and bring to a simmer. Stir together cornstarch and water and whisk into jus. Simmer, stirring, until slightly thickened, about 1 minute. Remove from heat and stir in remaining tablespoon syrup. Serve pork with sauce. 1. Brine is so cool! Wow. I brined for about 20 hours, and it definitely didn’t overpower the flavor of the meat. 2. The garlic-sage rub is delicious and imperative…I made one mistake here, which is that I didn’t think it sounded like enough maple, so I added some. Not necessary; this dish would have been plenty sweet and maple-y without it. 3. Even though my roast was more like two pounds, I still cooked it for a little more than an hour, just to make sure it was cooked through (because it was short but thick)…it probably didn’t need that much time, but I brined it so long that it wasn’t going to dry out, and it came out perfectly. Beautiful presentation, delicious dish! Every single flavor was present—the maple, the bacon, the garlic, sage, and even bay leaves came out. The gravy/glaze with that cider vinegar tang is smashing. All in all, this required a little forethought with the brining, but was relatively easy and delectable. I served it with sautéed broccoli rabe and roasted baby potatoes—a mix of little yukons, reds, fingerlings, and purples, which J cut into little nibble-sized pieces and I tossed with olive oil, bay leaves, oregano, fresh thyme, rosemary, and sea salt, and roasted alongside the pork loin for about forty minutes. PS. I'm really enjoying the picture of my bacon-wrapped pork right under the "Fat-Burning Recipe" advertisement. Yum! I must must must make this... thank you so much for sharing! "Sure, Lisa, there's some magical animal that gives us pork chops, bacon, sausages, and ham! Sheesh. Yeah right!" Oh, Homer. It's so beautifully true! No bacon that I could buy in the grocery store would look this good. Unfair!...but I'm trying it anyway. actually...that's Boar's Head bacon, you can get it anywhere =) I didn't want to use the fancy bacon because it's thick and I thought it would make the dish too fatty.